– for prolonged sequences of action and violence including intense gunfire and explosions, some language and a brief sexual image. When you think of the name Roland Emmerich, if you’re a movie buff, then images of exploding buildings, fireballs, a frozen New York City skyline and an obliterated White House are likely to come flooding into your mind’s eye. What you might not associate with Roland’s filmmaking legacy, however, are period movies like The Patriot or 10,000 B.C.. After 2011’s apocalyptic end times disaster movie 2012, Roland decided to retire his mass destructive themed films to focus on other projects. 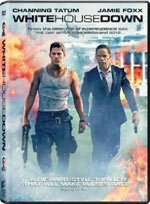 The first of which is White House Down (which confines the mass destruction mostly to one location). In the same vein as action films like Lethal Weapon or Die Hard, White House Down takes a slightly old school approach to the action genre, mixed with Emmerich’s personal over-the-top touch. Emmerich spends the first half hour of the film setting up the pins as we meet John Cale and his young, politics-loving daughter who lives with his ex-wife (I love a good story setup, but the first half hour is mostly uninteresting). When we meet John, who’s a former military man, he’s heading to the White House to apply for a job in the president’s secret service. However, he wasn’t expecting to run into an old flame in Maggie Gyllenhaal who is pretty quick to crush his dreams. Meanwhile, things are falling into place for all mayhem to break loose in the country’s capitol. Emmerich’s love for destruction and violence is realized once the patriotism hits the fan, and even though things get more outrageous and silly as the movie progresses, White House Down is a heroic action flick that fans of the genre are likely to enjoy. While I haven’t been a fan of Channing Tatum (I still think he’s one of the worst possible picks for the character of Duke in the G.I. Joe movies), this film seems more suited for him. Tatum is by no means a strong actor, but he gets the job done here. However, while Emmerich has Tatum filling in as a glorified John McClane (he’s even named “John” for crying out loud! ), the director has no problem making him seemingly bulletproof as his heroics get more elaborate with each explosion and hail of bullets. Jamie Foxx steps into the role of president which seems believable enough… that is, until he teams up with Tatum in more of a “buddy” role. The two play well together, but it becomes more difficult to accept Foxx as the president of the United States once the action erupts. The terrorists in the film do a pretty good job as menacing villains, but a mole in the White House who reveals himself to be heavily involved is a bit too cliche in almost every scene. It actually helps dumb down the film further. Joey King, from The Dark Knight Rises, is decent as John’s daughter in distress, serving as a tough little gal who gets separated from her dad just before the terrorism begins. It then becomes a major part of the plot of John trying to find her and get her out of the White House while also protecting our nation’s leader. Emmerich’s 2012 was special effects-heavy and seemed to be mixed in its execution, and White House Down isn’t really much different, even though it’s not a disaster movie. As such, we see iffy green screen work around the White House and unconvincing shots of a car being propelled into a pool or helicopters doing low flybys. It’s not enough to completely ruin the experience, but it’s so-so special effects-heavy ventures like this that make them seem less like they could actually ever happen and more fantastical to experience. But if you couple that aspect with odd humor, like John comedically scolding the president of the United States for dropping a rocket launcher out of a car window, you really end up with a film that isn’t meant to be taken too seriously to begin with. 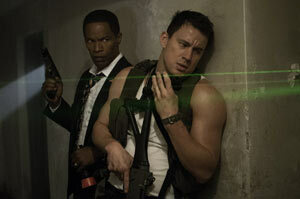 The content for White House Down almost tips in favor of an R-rating. This is mostly due to the profanity in the film; with one “F” word (said as “F— you.” by Jamie Foxx) and possibly some more that slip by among the roar of explosions and gunfire, roughly 30 uses of the “S” word, a dozen uses of “g*dd*mn” and quite a bit of other blasphemy, the profanity feels constant–especially for a PG-13 film. The language really doesn’t start until the action does half-an-hour in, but it hardly lets up once it does. But to make matters more intense, the action is pervasive. When the terrorists seize the White House, there’s a lengthy scene where they go from room to room dropping security guards and personnel with silencers or sprays of machine gun fire. There’s some blood here and there, although it’s not usually very graphic. However, near the finale, a character is mowed down with a chain gun. Realistically, it’d be a very graphic sight, but Emmerich downplays the imagery by hiding any potential gore behind the gunfire blasts and smoke. The film still isn’t as bad as a given rated R action movie would be, but it definitely pushes the envelope some. 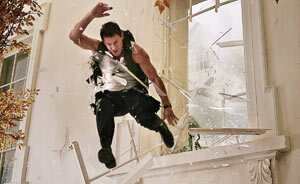 Overall, if you’ve seen any Roland Emmerich film, you can pretty much know what to expect from White House Down. It’s got the same corny tone as most of his films do and plenty of over-the-top action that requires you to suspend your disbelief. Still, like most of Emmerich’s films, they’re still relatively entertaining if you don’t take it too seriously. The content certainly contributes to the fact that I can’t just personally recommend the film, but those who are fans of the director, the genre, or any of the cast will probably enjoy White House Down. Men of Action (3:44) – The second featurette offers lots of behind the scenes footage spliced together in quick cuts and focuses on how Tatum performed all of his own stunts. It’s not even four minutes long, so it crams as much as it can into its short running time about stunts and action in the film. Roland Emmerich – Upping the Ante (5:10) – Here, Roland talks about it being his first action movie in a while. This featurette focuses on his style and methods and his on-set energy as a director. Meet The Insiders (5:14) – The last one is all about the bad guys in the film, as well as the other secondaries (like Joey King and Maggie Gyllenhaal). All five featurettes are worth watching, but it’s kind of unfortunate how short they all are. Blood/Gore: The terrorists shoot a guy point blank with a silencer, showing a little blood; Three security guards are shot with a little bit of blood on their clothing; We see a dead body with a little blood on their shirt; We see a man with a bloody gauze bandage on his left hand; A terrorist has a bloody nose; We see a bloody wound on the clothes of Sawyer. We moves his jacket to reveal a bloody wound. John then helps fix him up, but the camera positions his head in the way of it; A guy has blood on his head; Another man has blood on his face; John has blood on his arm; There’s some blood on a man’s neck when Sawyer stabs him there; A car runs through a building and pins a man in front of it. He’s covered in blood before being shot down with a chain gun; A man who’s been shot pulls out a pocket watch with the bullet in it and some blood around it. A terrorist shoots up a door and then comes inside the room. John pretends to beg for his own life and then shoots the terrorist. When he leaves the room, he kicks the man’s body on the floor; A man shoots and kills everyone around the president; John shoots at that man and he shoots back; John shoots a couple terrorists and elbows another. We see more gunfire and shooting; The secretary of defense shot in the head (not show directly); A terrorist pushes a man; We see Emily thrown to the floor; While riding on top of an elevator, it almost crushes John and Sawyer on the ceiling; John shoots some terrorists and fights one the kitchen; Sawyer kicks a guy in the face repeatedly, then shoots a terrorist; A terrorist smacks Emily; John shoots at a man, hitting his hand; Terrorists shoot at them in the tunnels; They also shoot at the presidential limo and chase them through a basketball court where an SUV flips over; They shoot an RPG at a tank, and then several RPG’s at the limo; A rocket is fired at the gate; An RPG flips the limo into a pool; John and Sawyer throw a grenade and run inside the pool house. The terrorists then use a chain gun to shoot up the bath house, but it blows up; We see that Sawyer is wounded; A missile takes down a helicopter. Another fires on the roof, killing some terrorists. Surviving terrorists shoot it down and it crashes; John beats up the terrorist with the rocket launcher and a missile goes off, taking down another helicopter. Part of it goes through the roof and almost kills a man with its spinning blade; John still fights the guy with the launcher, hits him in the head with a rock and they fall through the glass windows on the roof; A man shoots at John and he jumps out a window; A missile hits Air Force One and the wings break up; A man shoots one guy and drags Emily around; Stenz shoves Emily; John sets a room on fire and stabs some guys; John throws grenade and a guy kicks it back at him; A White House tour guide beats a terrorist with a heavy, antique clock; A man shoots a terrorist twice; Sawyer hits a bad guy in the neck with a pen. That man then beats up Sawyer; A man punches and kicks John a lot. He then stabs him and blows him up; A bad guy and Sawyer fight more and the latter is shot; Emily attacks the bad guy and he throws her down; John runs a car through the side of a building. A man, covered in blood, is pinned at the front of the vehicle and John uses the chain gun on top of the vehicle to shoot the man dead. Man of Steel – New Krypton Infographic!